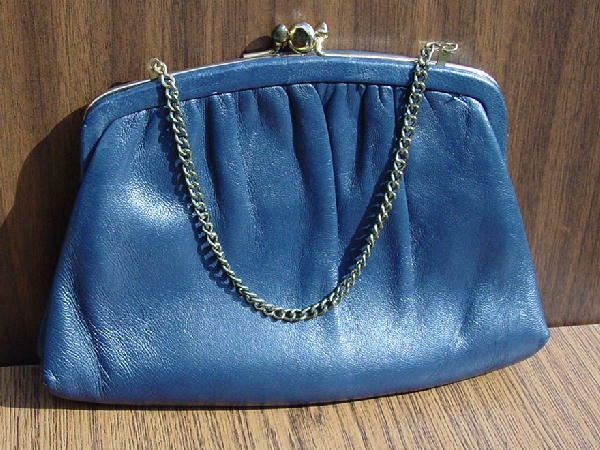 This vintage navy blue leather purse has a dual bypass clasp. There are 2 separate sections, each with its own blue-violet fabric lining. One section has a small tarnished gold-tone chain, which can be tucked in and the purse carried as a clutch - it looks better that way. There is an inner champagne-tan color fabric-lined pocket on the section with the chain. There are some scratches on the inside of the gold-tone rim.